The giant aircraft built by Stratolaunch as an air-launch platform made its first flight Saturday amid question about the future of the overall effort. The plane took off from the Mojave Air and Space Port at 6:58 am PDT (0958 EDT, 1358 GMT) Saturday and remained aloft for two and a half hours before landing back in Mojave. The plane handled well during the flight, Stratolaunch said afterwards, but offered no information on the future of the flight test program. In January, Stratolaunch ended development of its own launch vehicle that would have been launched from the plane, and for now only plans to use the plane for launches of the small Pegasus XL rocket. A SpaceX Falcon Heavy launched a communications satellite Thursday, with all three booster cores making successful landings. 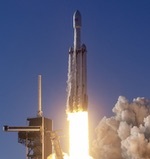 The Falcon Heavy, on its second launch, lifted off from the Kennedy Space Center at 6:35 pm EDT (2235 GMT). The rocket's upper stage released the Arabsat-6A satellite into a transfer orbit 34 minutes after liftoff. The two side boosters of the rocket made near-simultaneous landings on pads at Cape Canaveral a short distance south of the launch pad, while the central booster landed on a droneship downrange. In an interview, the CEO of Arabsat said the company chose the Falcon Heavy for the launch of the Lockheed Martin-built satellite in order to increase the satellite's in-orbit lifetime by several years.